If you’re lucky enough to have a lax dress code for Fridays at work, then this Look of the Week is for you. When dressing for casual Friday, you want to be comfortable, but still be professional. Continue reading to discover how to balance comfort and professionalism. What makes this combination of items perfect for casual Fridays at work? I’m always in my jeans when I’m not on TV, but I like to mix it up with different colors. With this look, I went for a Southwestern style. The bag is essential because it allows me to fit everything I need in it for the day. Do you prefer to dress up for the office or do you wish every day was Casual Friday? I dress up for TV every day, so when I’m not on TV I’m very casual. Clearly I’m going to choose the horse bangle because it combines two of my favorite things! What do you like most about Fridays at the office? I get to catch up with colleagues, catch up with hundreds of emails, reply to my Facebook comments and work on designs. The bangles, seed beads and clutch coordinate beautifully. It allows me to wear jeans, but dress them up a bit with the accessories. Do you prefer to dress up for the office or do you wish every day were Casual Friday? I don’t mind either way. It really just depends on how I feel in the morning and what kind of show I have. If I’m selling luxury, I don’t mind dressing up for the occasion. On Sundays I have my Lifestyle show, which I enjoy dressing down for. 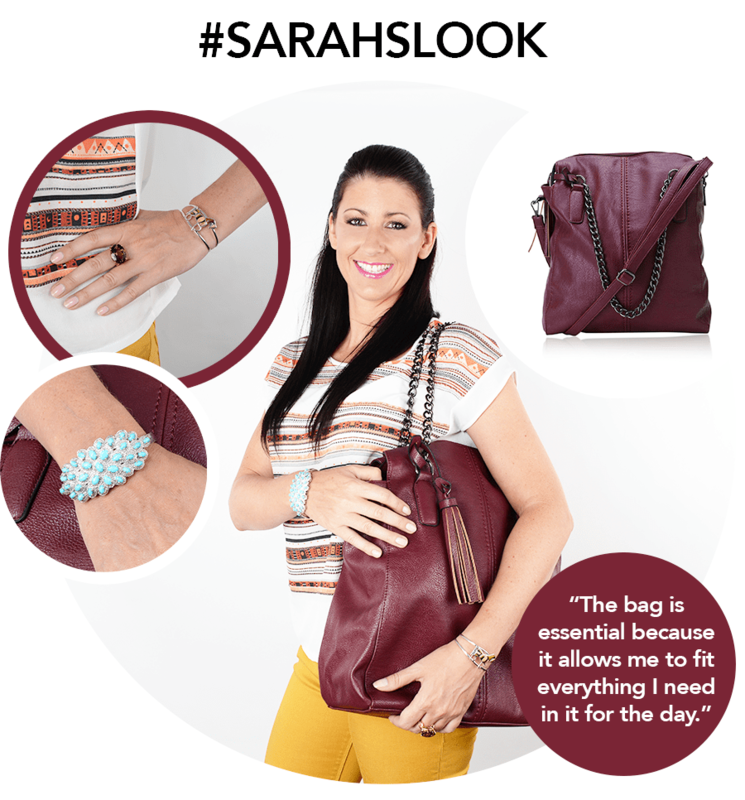 The bangles are my favorite because I enjoy layering and wearing accessories that add a little pop of color. The long silver necklace plays well against the bold fuchsia top, and I think the addition of a royal blue handbag adds personality! I’m also a huge fan of sleeping beauty turquoise, so having that in stud and cuff form really makes the outfit fun for me. I think it’s fun to have both. I’ve been in environments where I only wore workout clothes (a fitness studio), and then where I needed to dress up (a law firm). I think it’s best to have a balance of both, that’s why I think casual Fridays at work is a great idea. I love the Sleeping Beauty turquoise jewelry! It’s subtle, but it is always a crowd pleaser and the blue stands out against everything! I like to say it’s #fairytalebeautiful! I’m not usually here on Fridays, but I was at previous jobs. I feel like the vibe is more relaxed. There’s also so much potential for good things, whether it’s looking forward to a fun weekend, a better week ahead of you or just some much needed rest. The best part about the Look of the Week is that you can get all of these featured items right here at the LC! 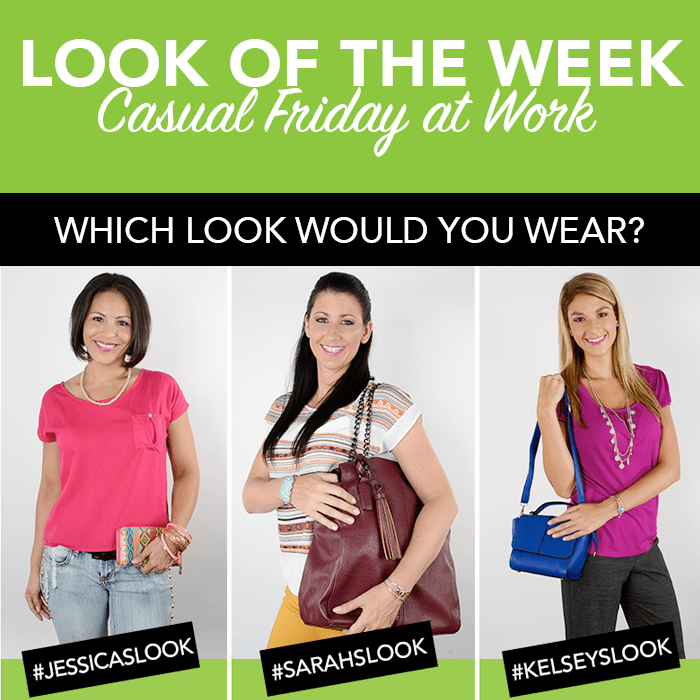 Now that you have THREE wonderful options for your next casual Friday at work, use the hashtags #SARAHSLOOK, #JESSICASLOOK and#KELSEYSLOOK on Twitter and Facebook to cast your vote!